Isaiah prophesied the destruction and abandonment of Damascus, Syria over 2,700 years ago. Yet the city continues today, despite so many Middle East wars and predictions that "this year" it will finally come to pass. So what's missing that has been holding this prophecy back? Israel’s strike on Iran? Or perhaps the overlooked prophecy in the Psalms about a future Arab war alliance targeted at wiping out Israel. Find out why the Arabs are sure to one day acquire weapons of mass destruction that leads them to finally attack Israel together again...and how their defeat opens up for the "beginning of sorrows" and Great Tribulation to finally happen. Update May 11: Iranian Missile Strikes On Israel = War? Israel is in the news again with the Iranian missile strikes on the Golan Heights from Syria. Israel immediately responded by attacking several Syrian targets. Naturally, people ask if this is prophetic and specifically, "could it lead to the fulfillment of Isaiah 17?" (when Damascus becomes a ruinous heap). Long Answer: As the article below explains, it has been 45 years since the last Arab-Israeli war despite the Arabs still hating Israel and wanting to destroy her. What's held it back despite hundreds of clashes since then? Keep reading below and you will understand all the real conditions in Scripture to Damascus's destruction—probably the next event in prophecy. This event sets up everything else, including the Third Temple  the Antichrist  makes his base, the gathering of the faithful to Israel . If you are into Bible prophecy, you probably have heard about the controversial nuclear program of Iran—and Israel's plan to strike Iran over it. In 2002, it was revealed that Iran had secretly been enriching uranium with thousands of centrifuges. Enriched uranium is the key component of a nuclear bomb. Nobody wants an apocalyptic religious state like Iran to have nukes. Even worse, Iran resumed enrichment once President Ahmadinejad took office in 2005 and he refused to stop it, despite severe sanctions against Iran. Even after the extreme Ahmadinejad left office in 2013, the concerns over Iran's nuclear program have only increased. It's no mystery who is most endangered by the prospect of Iran possessing nuclear weapons. Israel has threatened to make a preemptive strike on Iran's nuclear sites if sanctions continue to fail. This is no empty threat as Israel has bombed the nuclear sites of hostile nations in the past. Back in 1981, Israel bombed Iraq's nuclear reactor, receiving worldwide condemnation for it at the time. Then in 2007, Israel sent planes to bomb an alleged North Korean made nuclear reactor in Syria . Isaiah 17:1 (ESV) — An oracle concerning Damascus. Behold, Damascus will cease to be a city and will become a heap of ruins. Of course, the Damascus of the Bible is still recognizable today as the well-known capital city of Syria. Appropriately enough, it even has the famous distinction of being considered the world's oldest continuously inhabited city, inhabited from prehistoric times. If this is correct, then Isaiah 17 is a dire warning for this capital city of 2.5 million people. One day the city will suffer tragedy of some kind leaving a heap of ruins in its place. How Does a City Become A Ruinous Heap? If you investigate history, you will find that this type of extreme end of a city is unusual. To be sure, there have been several modern cities that have been merely abandoned but their buildings left intact. A famous example of this is Pripyat, Ukraine. Probably that name does not ring a bell, but this is the city where the famous Chernobyl nuclear reactor leak happened. Due to the radioactive fallout, it was deserted as a ghost town. Decades later it is safe to visit for short periods—as witnessed by the visitor's pictures you can find posted on the Internet, including such sites as the city amusement park. Or consider Hiroshima and Nagasaki, the targets of the first atomic bombs. They continue as cities to this day, despite having been partially leveled from first two nuclear bomb attacks in history. The reasons for this are twofold. The first two atomic bombs (Fat Man and Little Boy) used on Japan were on the small side by today's standards. Secondly, the bombs were detonated high above the cities, in what is called an “air burst.” Air bursts produce greatly reduced fallout levels compared to ground strikes. This makes it feasible to rebuild and re-inhabit the area, just as Japan did. Damascus' predicted fate is distinct from either of these cities or perhaps any other. Its buildings and streets will not just be deserted, but they will be left as a “heap of ruins.” I am not aware of a case in modern times of that happening to a city. There are cities that have been wiped out by tsunamis or even volcanic explosions, but they have been rebuilt and not left as heaps of ruins. The real estate still has value to former inhabitants and with a concerted effort they can achieve reconstruction of the city soon enough. Nevertheless, Hiroshima and Nagasaki may provide the best case for how Damascus' complete destruction and abandonment is likely to happen. A nuclear bomb with a larger yield or a series of bombs with smaller yields could turn an entire city to a heap of ruins. This is quite feasible in Damascus' case since it is small, only approximately 40 square miles in area. If a ground burst attack is used instead of air bursts, the lingering radioactive fallout would keep people from coming back to rebuild and re-inhabit it. Israel has long had an arsenal of nuclear bombs and is also a frequent target of attacks from Syria (and the terrorist organization Hezbollah in Lebanon). In fact, Israel has already been in several major wars with Syria between 1948 to 1973. Importantly, Israel also has the will to use these weapons. Because Israel's enemies are so numerous and able to overrun the tiny nation so easily, Israel has adopted a nuclear policy called “The Samson Option.” The name comes from the famously strong judge of Israel who took his own life by knocking out the support pillars of the temple he was in to avenge himself on his enemies around him. According to this policy, Israel would nuke the cities of her enemies if she was overrun or about to be defeated. Hitting the leadership of Syria at Damascus would be part of this retaliatory attack. Isaiah 17:3 (HCSB) The fortress disappears from Ephraim, and a kingdom from Damascus. The remnant of Aram will be like the splendor of the Israelites... 4 On that day the splendor of Jacob will fade, and his healthy body will become emaciated.... 6 Only gleanings will be left in Israel, as if an olive tree had been beaten—two or three berries at the very top of the tree, four or five on its fruitful branches. Isaiah 17:12-14 (HCSB) 12 Ah! The roar of many peoples—they roar like the roaring of the seas. The raging of the nations—they rage like the raging of mighty waters. 14 In the evening—sudden terror! Before morning—it is gone! This is the fate of those who plunder us [Judah] and the lot of those who ravage us. A multitude of nations attack “us” or the nation that Isaiah addressed in his prophecies: the southern kingdom of Judah (as opposed to the northern nation of Israel). The Jewish people make up the modern nation of Israel (which is why they almost called it the State of Judah). Therefore the description fits yet another Middle East war where Israel is attacked by her mainly Arab and Islamic neighbors such as Syria, Lebanon, Egypt, Jordan and probably also Iran (who is not Arab). Yet, like before, Israel will be victorious—and probably even quicker than in the Six Day War of 1967. Notice in verse 14 that it takes only from one evening until the next morning to achieve decisive victory. It sounds just like the Samson Option is exercised after Israel is left with no choice but to use her nuclear weapons against multiple enemy nations and cities. Their armies will literally be gone, not to mention a large segment of their civilian populations. The nuclear war casualties could easily surpass ten's of million people . No wonder Isaiah says that the situation shifts overnight from terror for Israel to tragedy for her enemies. With regular eruptions of conflict in the Middle East, prophecy teachers have naturally been expecting and predicting Isaiah 17's fulfillment practically every year. Yet, even after all the wars and the constant tensions, the war that seals Damascus's fate has still not come. Some think that Iran's nuclear enrichment program is the missing key because of Israel's threat to strike Iran over it and Iran's promises to retaliate strongly in response. It is possible that a wider Middle East war including Syria could be triggered by this conflict. Yet, as covered earlier, preemptive strikes by Israel are nothing new. They have yet to lead to wider war, let alone a military response. Here's the thing: Between 1948 and 1973, Israel fought four wars with her allied Arab neighbors. That's an average of one war every eight years. However, it has now been four decades since that last major war, the Yom Kippur War in 1973. There must be a reason for this record span of time without more major conflicts. It is obvious from the news that the Arabs did not change; they are still hostile and object to the existence of Israel in their midst. Yet they have stopped trying to launch massive attacks on Israel together as three times before. I think the answer is obvious if you think about it. Israel's growing nuclear arsenal and increasing capability to deliver it is why. As reported in Der Spiegel , intelligence sources confirm that in that last war (The Yom Kippur War), Israel had nuclear weapons loaded on the fighters planes ready to go if things continued to worsen for her. The Arabs know Israel has these weapons and is willing to use them if necessary just as they are willing to do unpopular preemptive strikes when necessary. This nuclear deterrent would explain the relative quiet since 1973. It has changed the balance of power. Israel's enemies risk inviting asymmetrical force if they try to overrun and take over Israel as they did when the State of Israel formed in 1948. For this reason, I believe the Arabs have not joined in war against Israel again. Of course, the more radical states, like Iran and Syria still talk and act belligerently. However, most of the Arab states are moderate and have had peace treaties with Israel for years now. Although they may not like Israel, they must realize how much they have to lose compared to what little they have to gain by trying to invade Israel now. The prophesied war of Isaiah 17 will simply not happen as long as Israel has a strong nuclear deterrent no matter how much tension with Iran or Syria we see or how many times prophecy teachers predict it. Psalm 83:13-17 (HCSB) — 13 Make them like tumbleweed, my God, like straw before the wind. 14 As fire burns a forest, as a flame blazes through mountains, 15 so pursue them with Your tempest and terrify them with Your storm. ...17 Let them be put to shame and terrified forever; let them perish in disgrace. The analogies used by Asaph bring to mind the fiery, storm-like blast of a nuclear bomb, just as Isaiah 17 seems to demand for Damascus. Like Isaiah 17, Psalm 83 also points to multiple nations' being involved and being obliterated in response. Most interestingly, it mentions a war covenant, alliance or confederacy among these nations with the “one consent” purpose of wiping out the nation of Israel, even erasing her name from history and taking the land for themselves. With the peace treaties and moderate states among the Arabs, this pact does not seem to exist today. There is no way to win against vastly superior weaponry; such a pact would amount to a suicide pact today. In other words, what is holding back this confederacy from forming is the Arabs having an answer to Israel's nuclear weapons. Therefore, if Israel's enemies develop nuclear weapons or other weapons of mass destruction (WMD), this confederacy would finally make sense. This could still take several years especially if Israel goes ahead and strikes Iran. In fact, rather than expecting the wider war to happen from a strike, we should look for the lack of a strike that keeps the inevitable acquisition of WMDs by the Arabs on schedule, rather than delay it. Many prophecy pundits who expect this prophesied Middle East war often think that it will lead next to the Ezekiel 38-39 Gog Magog war. The reason for this is Ezekiel also talks about an attack on Israel. The attacker named as Gog of Magog is popularly thought of to be Russia, or lately, even Arab or Islamic hoards. But if you put the Magog identity question aside and focus on the timing of this war through linking it up with two parallel prophecies, you'll see that it has nothing to do with any pretrib war. I've written another article explaining this called: The Two Gog Magog Wars . Instead of the Gog Magog war, the effects of this war sets up for something much worse. 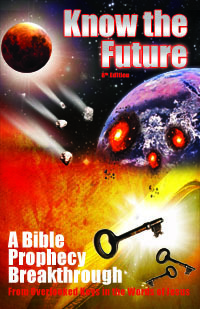 The Great Tribulation cannot commence until the Arabs are taken out of the picture. This is because right before the Great Tribulation, the 144,000 Israelites must assemble on the Temple Mount so they can be sealed by angels that appear then (Rev 14) before going out to preach their witness to the world during the Great Tribulation. Also, several passages talk about Israel rebuilding the Third Temple (Mt 24:15; Mk 13:14; Rev 11:1-4; Dan 11:45; 2Th 2:4). Neither of these events are going to happen as long as the Arabs have political control over the site. Once their power is diminished from Israel's devastating Samson Option, it is easy to imagine the Temple Mount will at that time go back to Israeli control. The other reason this war must come next is that this Middle War prophecy spoken of in so many OT passages cannot fit any other time. In the Millennium and post-mil periods, there will be no wars at all due to God's Kingdom. During the Great Tribulation, the Beast will have power over all nations and bring his own form of peace through dominion—once he defeats Israel himself at the start (Lk 21:20). The only place to fit a war between Israel and the Arabs is in our current pretrib period. To be sure, Isaiah 17 is a frightening prophecy since it means we will witness the shocking end of a famous capital city along with the millions of people living there (and in other targeted cities). But after full consideration, perhaps the scariest part about it is what it means for the rest of the world. When it's over one of the last major prerequisites in Bible prophecy for the start of the Great Tribulation will be met and the “beginning of sorrows” Jesus spoke of can commence next. To continue learning on that topic see my article Earthquakes in Prophecy  or the Sign of the End Jesus  gave. Obama's now-defunct deal with Iran to limit their nuclear program was an interesting development for those watching the Damascus prophecy. The deal  tried to block an Iranian nuclear bomb by monitoring Iran with inspectors and reducing their uranium stockpile and centrifuges needed to enrich more uranium. At face value it would seem to delay Iran being the answer to Israel's enemies acquiring a nuclear arsenal, but did it? As many expected and I reported here, Iran could and would cheat. Benjamin Netanyahu shared proof that Iran cheated and lied about it in April, 2018 a week before Trump canceled the Iran nuclear agreement. Even with the cheating and Iranian progress, one thing should not be doubted: the path to a nuclear arsenal like Israel has or which can be used by the Muslim nations to face Israel in war is not easily or quickly acquired. They won't develop it overnight or this year or next year. People have been predicting nukes in the hands of Israel's enemies "real soon now" or "next year" since at least 2002. They have been wrong every time. It's not as easy as they think, especially for sponsors of terror like Iran and Syria. That's why I still maintain even with Obama's misbegotten deal we won't see the nuclear capability in Israel's enemies hands until early 2020s. I've been watching prophecy since the '80s and one thing I have learned from that is things go slower than most imagine they will. This goes doubly for catching up to a nuclear power like Israel enough to think you can win a war with them. Does ISIS Having Nuclear Material Change Anything? Prophecy points to the end of Damascus through a nuclear weapon, such as Israel, the archenemy of Syria, has been building and testing for several decades. Other Arab/Muslim capital cities are also destroyed following a joint attack by Syria and other Arab nations around Israel, per Psalm 83. Before Damascus is destroyed, Psalm 83 describes an alliance of Israel's neighbors bent on wiping out Israel and all memory of her. Taking on a nuclear power like Israel is suicidal until nuclear parity is achieved. One bomb or "suitcase" nuke is not enough when you're provoking a country with missile defense and a capable nuclear arsenal. When you understand the above, the latest rockets from Gaza and ISIS having nuclear material will not lead directly to Damascus' destruction. The rocket attacks have been going on for years. Israel simply does retaliatory strikes in response. The nuclear material seized is low grade Uranium, not weapons-grade, the kind you need for making a bomb. Even a dirty bomb made with it would not be effective . The Psalm 83 war alliance still must appear first and none of the above is able to set the stage for that. When more and more Arab nations sound like Syria and Iran, then Damascus' end is nigh. But they will not do that until they have a way to answer Israel's nuclear Samson option. No nukes vs. nukes = suicide. That's why they are actively pursuing enriching uranium. Matthew 24:6 (HCSB) — You are going to hear of wars and rumors of wars. See that you are not alarmed, because these things must take place, but the end is not yet. Update: Dreams-Based Insight on Timing - 2022? After many years of me dismissing rumors that "Damascus' end is nigh," something changed in 2017. In December of that year, Trump announced his official decision to both recognize Jerusalem as Israel's capital and to move the US Embassy there. I was convicted this finally was a significant event making progress towards the ME War and immediately started writing an article on the US Embassy Jerusalem move . That night my conviction seemed confirmed by a special dream . Months later, I got further confirming insights about the ME war indeed coming soon. I had previously only understood the war must come by or before the 2024-2030 Sabbath year cycle candidate for the 70th week. But as my 50th birthday approached, I got insights about the ME war coming specifically in the year 2022  as you can read about in my supporter's section . Objection #1 - "How Do We Know the Ps 83 Alliance Is Not Already In Place?" It's a fair question. To be clear, I'm not expecting a publicly announced alliance. It won't have to be public or announced. We will know by Arab troop movements, arms shipments and change in rhetoric. Again, knowing history helps, especially the wars of 1948, 1967 or 1973. For example, in 1946-47 Israel saw the writing on the wall. Ben Gurion ordered that they began collecting arms. Because he could see what the Arabs were planning, he was ready for their attack in 1948. How much more so today. We live in a ultra-connected world. It's hard for anyone to do anything without someone recording it on their phone and posting it to their blog or social media. Big changes in the mentality and plans of the Muslims and Arabs won't escape notice for long anymore. Also, when the Muslims have nukes, we'll all know soon enough. Israel's intelligence will find out and cry about the coming nuclear holocaust to get the US to take action. Also the rhetoric of the Muslims is sure to change. Today the extremism comes mainly from Syria and Iran. When they unite behind nuclear weapons per Psalm 83, you can trust that things will be different than today and the signs will be there. Objection #2 - "Couldn't They Already Have Bought a (Suitcase) Nuke? (It Only Takes One To Destroy Israel)"
No country wants to be a pariah for proliferating nuclear weapons to a terrorist-friendly nation, even Russia. Nuclear devices are not as simple as other arms to buy, transport, store, maintain and use. They require special tech for all phases of life. For example, the lead casings must be replaced with time or radiation begins to leak. You basically need the kind of tech that you would develop anyway by having a nuclear program. So if you buy a bomb, you need to buy the people to go with it. It's not like buying, say, a fighter jet. I think the above reasons can explain why you're seeing nations like Iran going to such drastic, unpopular, boycott-inducing lengths as to have nuclear programs instead of just shopping around for a secret "suitcase nuke," etc. Speaking of which, it's a myth "you only need one bomb to take out Israel." Israel is no easy target. Bombs can be detected, stopped, or simply even fail. Israel has a world renown intelligence service, the Iron Dome missile defense system and spies adept at assassination and sabotage. Thus, to ensure a successful nuclear strike on Israel, you need an arsenal of nukes, just as Israel has developed (hmm...). No nation is likely to invite a devastating nuclear reprisal from a nuclear power like Israel by attacking them with one stinking bomb. Objection #3 - "They Won't Wait For Nukes to Bring in the Mahdi/12th Imam"
A common objection is basically that the Arabs are not rational people. This means that they are not afraid of a nuclear response like normal people, nor will they wait to acquire nuclear weapons before attacking Israel. Often cited to explain this is a radical Islamic slant. Supposedly, Iran has stated that it would sacrifice most of its country to usher in the 12th Imam. The problem with this thinking is the history. If the Muslims are so irrational, so bold, or want the Mahdi so badly, then why did they stop launching joint attacks on Israel after 1973's failed Yom Kippur War? Forty-five years is a long time to keep one's wild, reckless zeal from leading you to launch a massive invasion of Israel. We may not understand the Arab mentality or their Islamic religion, but I think it's a mistake to write them off as irrational or reckless. I think their reluctance to make war on the regional nuclear power that emerged in the early '70s shows they are more reasonable and calculating than some want to give them credit for. They are waiting for a reason...and pursuing nuclear weapons for a reason. Objection #4 - "What About the Hundreds of Scud Missiles Pointed at Israel?" Syria claims to have hundreds of scud missiles in pointed at Israel. Iran has warned that thousands of missiles will rain down on Israel if the US moves on Syria. Given these claims of conventional power, are nuclear weapons really necessary? Again, history is our friend to meet the objection. Scud missiles have rained down on Israel before. The result? Almost no casualties each time. I'm always amazed at how ineffective these missiles are. They seem to be more of a nuisance than a game-changer like nuclear bombs are. They're certainly not going to defeat Israel through them. There is no substitute for nuclear weapons to match nuclear weapons. Objection #5 - "I heard a teacher say Psalm 83 is not a prophecy." It's extremely difficult to prove something is not a prophecy, much like trying to prove a negative. The NT quotes things in the OT that did not look like a prophecy to first readers, like "out of Egypt I called my son" (Hos 11:1)referring to Israel originally but applying to Messiah's later visit to Egypt when he was young (Mt 2:15). And my position on Damascus and a group of nations does not require Ps 83 as Isaiah 17 already establishes this. Also the pact to go against Israel is likewise implied in Isaiah. Like I say in my latest article, this war on Israel and Damascus is not going to happen until an answer is developed for the Samson Option. For more on this objection, see this blog post Refutting Chris White's Arguments On Why Psalm 83 not a Prophecy .